A wine professional since 1999 and a wine enthusiast since my youth, the goal for Grapelive was and is to focus on small production “terroir” driven wines that have a real sense of place about them and to highlight the amazing people that make them . The Wine World has many great stories to be told and secrets to uncover and Grapelive will travel the world to bring them to light and relate them to you. 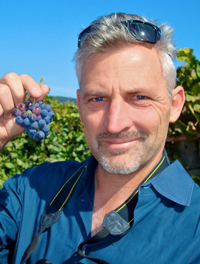 Based in the SF Bay area, Grapelive continues to search out and highlight the passionate winemakers and interesting wines of California and beyond. Having been a long time wine consultant and buyer I have been involved in marketing, sales and public relations, for wine merchants, wineries and award winning restaurants I feel I have a depth of insight into the wine business that comes from being involved in the business day in and day out, both from my time working at wineries themselves, selling wines directly to customers, as well as attending world class seminars, trade tastings and through wine travel I have given wine classes, hosted rare wine tasting events and through new media have connected with thousands of wine enthusiasts and professionals. I love the wine business and enjoy finding new wines and exploring new regions, and of course writing about my travels and the wines as I go. Grapelive has been providing content, wine reviews, breaking news and in depth articles since 2001. Please visit often to see what is setting trends from small producers and wine regions from around the world.